I discovered this potential Hummel Girl Figurine while out on a local thrift shop hunting trip. I am not all that familiar with Hummel figurines, and I wasn’t quite sure who she is or even if she is authentic. 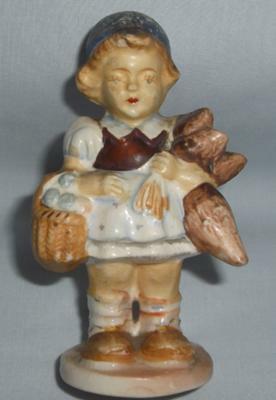 I realize that the Hummel Girl figurine is supposed to carry the Goebel maker’s mark, but this one does not. Yet she was intriguing enough for me to bring her home. 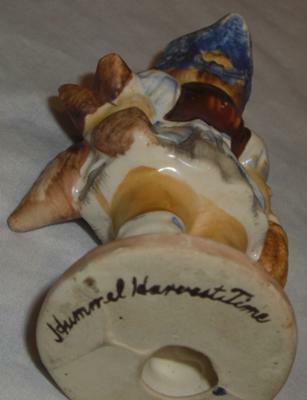 She stands at just over 4 inches high and is hand signed on the bottom ‘Hummel Harvest Time’. 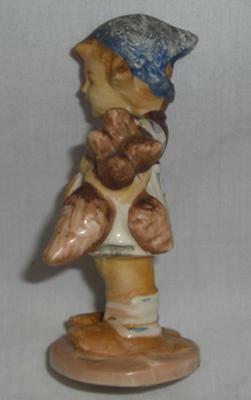 This potential Hummel Girl figurine is obviously old, but in my limited research I was unable to identify her as authentic or reproduction. I’ve read that M I Hummel was under contract to sign each piece yet I have not found any graphic to show how the signature should look as this may provide a clue. 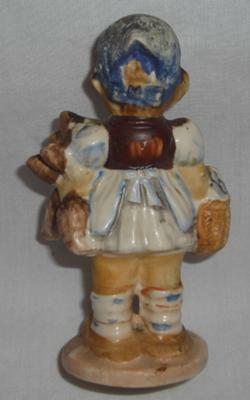 Were any Hummel figurines made that do not carry the Goebel maker’s mark? Who is she? When was she made? Comments on dave’s Hummel Girl Figurine? M.I.Hummel signature by: Jonathan H.
Check the side of the base maybe in the back, for the M.I.Hummel signature, mine was very faint and just lightly embossed in the ceramic so it was pretty hard to see.